This is a diamond necklace collection from Russian royal family. Chronicles the history of the Russian royal collections once shocked the world. In 1719, the Great Peter search for diamonds, jewelry in the worldwide,and created the Russian government gem library, all the jewelry have been collected into this library. After following Peter the Great, the most obsessed with the collection of jewelry is the Queen Catherine. Women like men can command the world, but still not throwing love beauty nature jewelry, the Great Catherine love diamond abnormal obsession was crazy, and she be called professionals, on the diamond cutting and inlay process is highly demanding.In Russian history the most outstanding experts in diamond-cutting period was occured in the period of the Great Catherine. This magnificent diamond necklace was inferred that ordered in the mid-18th century for the Great Catherine, which is symbol of the Queen's beauty and power of the best testimony in the year. We appreciate this diamond necklace, while it is not difficult to infer how the Russian royal life is rich and luxurious in the year. 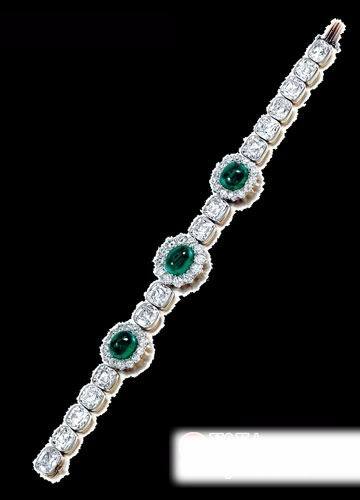 This is an emerald bracelet with diamond inlay that Tiffany & Co.'s launched in 1900, the entire bracelet length about 170 mm, from 15 natural diamonds constitute, bracelets back faintly discernible Tiffany & Co.'s logo, after years of sharpening, diamond is still long-lasting bright shining light. Tiffany & Co. Brand was founded in 1873 in the United States, its brand philosophy is to coordinate, uniform and order, integrated into a unique boutique, we can easily be found from the basis for this auction product. As for why the living bracelet auction in Europe, behind the story we do not know. 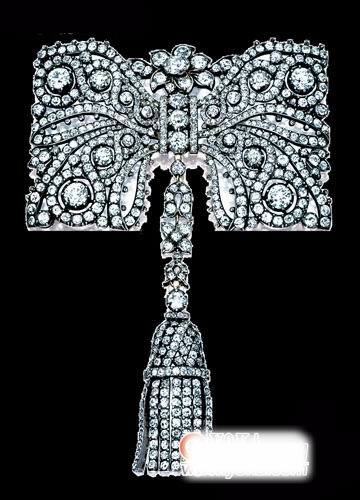 This is a a pure diamond bow brooch from Paris Cartier descent in late 19th century , crafts for the 18K gold and silver inlaid diamonds. Lace bow brooch main body resembles the shape of a delicate butterfly knot, symmetrical "two wings" were inlaid with four old European cut round diamonds, two larger diamond weight about 3.6 carats and two smaller is about 3.5 karats. This diamond brooch as a whole plump shape and elegance. 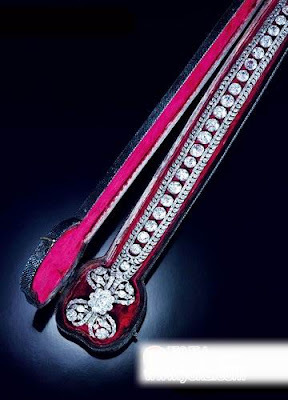 King Edward 7 World Bank has been praised Cartier as "the emperor's jewelers, jewelers of the emperors", Cartier was founded in 1847, developed to this diamond brooch Chupin the late 19th century, Cartier has entered the glorious heyday. When i Would like to introduce you to this retro gold enamel necklace, it would have mentioned the 18-19 century Roman jewelry masters Fortunato Pio Castellani (1794-1865), he and his two sons are well known to the world for their perfect art of carving and exquisite, in many excavated antique jewelry it can be found their works throughout the 18-19th century, countries bordering the Mediterranean. Which to build this jewelery Carlo Giuliano (1831-1895) was work for the Castellani, they have co-authored a number of classic masterpiece jewelry. 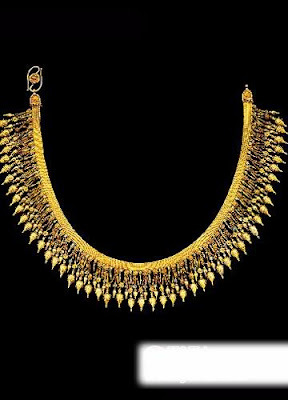 This retro gold enamel necklace was Giuliano approximately 1860-1863 years according to a precise imitation Greek-style necklace in AD 300 years or so to modelled on . The retro gold dotted blue and green enamel flower materials, design complexity, subtlety. In 1872, the British Museum was bought from the Castellani's son, Alessandro.And now, Ms. Judith H. Siegel Collection. Africa style necklace and brooch set around an Egyptian born in 1860, Renaissance is a set of gold, porcelain stone, glaze the perfect combination of scarab-shaped necklace and brooch. it is made by Castellani in Rome from 18-19 century studio, which showing that Castellani superior micro-mosaics, 16 scarab-shaped antique pottery to micro-mosaics fixed in a special geometry base. 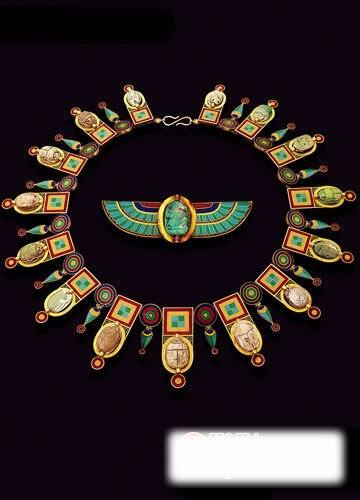 The necklace and brooch is still maintained most of its original geographic features, showing ancient Egypt, in particular, the design style.